J.H. Rudolph & Co., Inc. Downtown Evansville Parade is Sunday, November 20! J.H. Rudolph is excited to announce that we will have a parade float featured in the 2011 Downtown Evansville Christmas Parade, which takes place this Sunday, November 20, 2011 at 3:15 pm (CST). 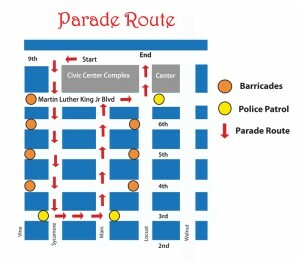 The parade route map is below. Use it to get a great spot on the parade route to watch all the wonderful floats and candy tossers as they go by. Hopefully the rain will hold off! This event is coordinated by GAGE, the Growth Alliance for Greater Evansville, and includes a Santa’s Workshop from noon to 3:00 pm (CST) at the park located at 4th and Main Streets. Santa’s Workshop will feature photos with Santa, arts and crafts and more! You are currently browsing the J.H. Rudolph and Co., Inc. blog archives for November, 2011. Copyright 2007 - 2019, J.H. Rudolph & Co., Inc. All Rights Reserved.